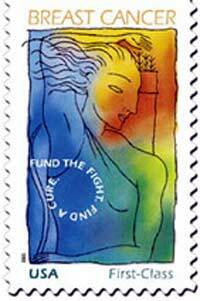 As you may be aware, the US Postal Service sells a "Fund the Cure" semi-postal stamp to help fund breast cancer research. The Breast Cancer Research semipostal was issued on July 29, 1998, at a first day ceremony held in the White House. It was the first semipostal in U.S. history. To date, the stamp has raised more than $39 million for breast cancer research. By law, 70 percent of the net amount raised is given to the National Institutes of Health and 30 percent is given to the Medical Research Program at the Department of Defense. Instead of the normal $.37 for a stamp, this one costs $.45. The additional $.08 goes for breast cancer research. A "normal" pane of first class stamps costs $7.40. This one is only $9.00. There are two other special stamps that the Post office has designated as 45-cent fundraising or "semipostal" stamps. The Heroes of 2001 semipostal was issued on June 7, 2002, at a first day ceremony held at Battery Park in New York City. It helps raise funds to provide assistance to the families of relief personnel killed or permanently disabled in the line of duty in connection with the terrorist attacks of Sept. 11, 2001. The stamp has raised nearly $10 million to date. The net amount raised is given to the Federal Emergency Management Agency for distribution to the appropriate recipients. 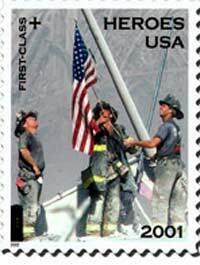 A detail of photographer Thomas E. Franklin's famous photograph of three firemen raising the U.S. flag at "ground zero" in New York City is depicted on the stamp. Derry Noyes of Washington, DC, was the art director for the stamp. 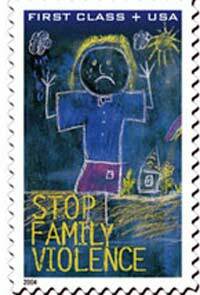 The Stop Family Violence semipostal was issued on Oct. 8, 2003, in Washington, DC. It helps raise funds for domestic violence programs. The net amount raised is given to the U.S. Department of Health and Human Services for domestic violence programs. A heart-wrenching image of a distraught woman drawn by 7-year-old artist Monique Blais of Santa Barbara, CA, is the focal point of the stamp and is intended to increase awareness about this important social issue. Carl T. Herrman of Carlsbad, CA, was the art director for the stamp.